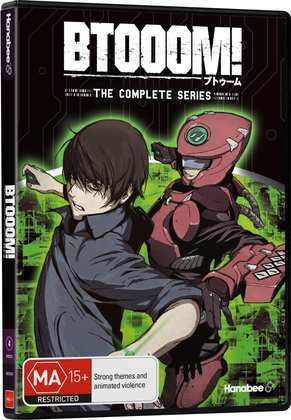 Normally, the only second look that I have in an Anime Review Roundup is the Rewatch bit, but this week, it’s all second looks, beginning with Btooom! Having unexpectedly enjoyed the MVM DVD release of this survival game anime, I gave it a quick upgrade to Blu-ray, although I did have to import to do that. A videogame addict spends all his time playing the eponymous game, a first person shooter without guns, but with a wide variety of bombs instead. Then one day, he wakes up in a jungle on a desert island, armed with a cache of bombs, and expected to play the game for real. Click on the review to see if the HD version is worth the upgrade. 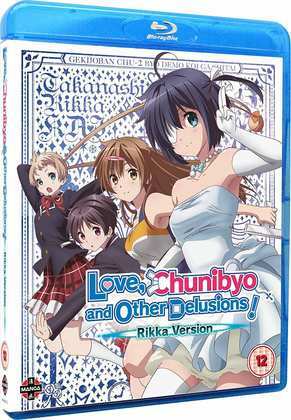 The other anime that I looked at last week was Love, Chunibyo and Other Delusions! The Movie: Rikka Version. I haven’t seen the movie before, but since this first of two movies is a recap compilation of the first season, it’s fair to say that I have indeed seen its story before. Rikka Takanashi is the Chunibyo of the title, a high school girl living with fantasy delusions of super powers and hyperbolic narratives. Yuta Togashi is the boy who’s trying to put his own childish delusions behind him, but gets sucked into Rikka’s world when he meets her. The first season developed their relationship, and this film focuses on that. But to get everything into its runtime, it had to cut a lot out; a little too much when it comes down to it. K-On! Season 2. Now here’s a KyoAni series I can really get behind. Season 1 was the perfect confection, five girls form a pop rock band in high school, and spend loads of time eating cakes and drinking tea, and generally being cute. Season 1 followed them across 14 episodes, 2 years of high school. Season 2 is a full 27 episode run, but has only one year of high school left to play with. Story-wise it’s four times as diluted as the first season, less music in the grand scheme of things, and a lot more cute frivolity. And it still works; the characters are adorable, the episodes are fun, and the music is still ear-worm material. Manga Entertainment released K-On!! Season 2 on DVD only, just like the first season. I wound up importing the Region B Blu-rays from Madman Entertainment in Australia. Here’s my review for the first half. At this moment in time, those Blu-rays are going out of print, if not out of print already, so Region A might be your best bet if you’re capable of spinning those discs. 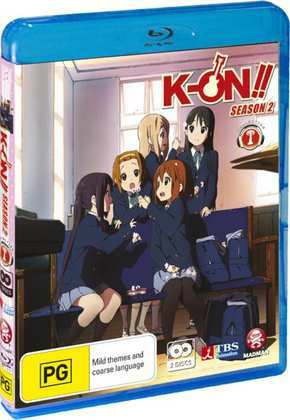 But, Region A fans also have something to look forward to, with Sentai releasing the K-On! Complete Collection Premium Boxset at the end of November. For your considerable cash, you get the first and second seasons, and the movie, and for the first time the K-On! short animations (that suggests a re-author, and hopefully a fix of the audio screw-up in Season 2 episode 11). There are also a wodge-load of physical extras, including the soundtrack CD, key chain, art cards, guitar picks and more. My wallet is relieved that I can’t play Region A.
Hanabee Entertainment re-released Btooom! as a DVD/BD combo in 2016. Manga Entertainment will release Love, Chunibyo and Other Delusions! The Movie: Rikka Version on Blu-ray and DVD on July 30th.